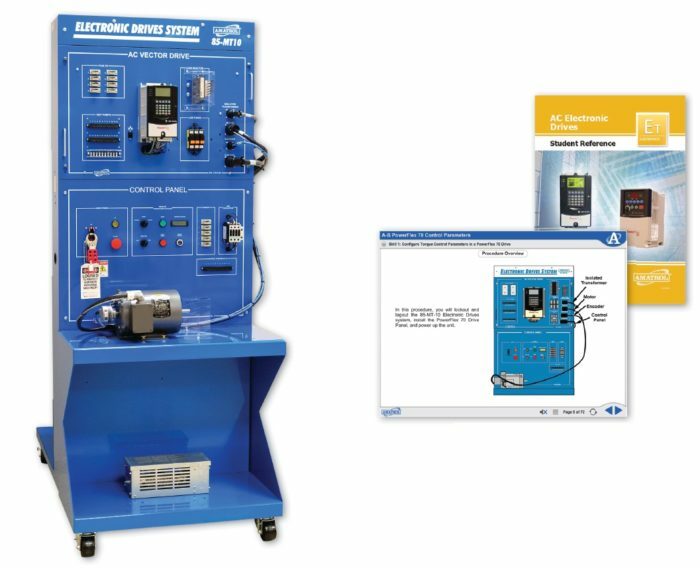 Amatrol’s AC Electronic Drives Learning System (85-MT101) teaches industrial AC electronic motor drives that are used to provide accurate control of speed, position, and acceleration in applications such as CNC machine tools, conveyors, robots, mixers, and presses. The 85-MT101 teaches learners how to troubleshoot electronic drive motor control circuits under realistic conditions with circuit faults that can be introduced throughout the system. The 85-MT101 includes a manual fault insertion system, AC vector spindle drive panel, AC general purpose drive panel, AC servo axis drive panel, a .75 HP induction motor, and a 1 HP brushless servo motor. Learners study industry-relevant skills including how to operate, install, tune, and troubleshoot three major types of AC systems: AC vector-type spindle drives, AC servo axis drives, and AC variable frequency drives. This factory automation training system uses industrial quality components to both standup to frequent use and to help learners become better prepared for what they will encounter on the job. The 85-MT101 uses drives and motors that are the standard, heavy-duty models that learners will find in the factory automation field. A variety of brands and models are offered to give learners a comprehensive experience that will prepare them for the many brands and models they will encounter. Learners will use these industrial components to practice hands-on factory automation skills such as: editing PowerFlex 70 parameters using the HIM; configuring a PowerFlex 70 drive to skip selected frequencies; and connecting and operating a general-purpose AC drive. This system features a modular system design with interchangeable drive panels, so learners can quickly set up different types of AC drives. Each drive panel attaches to the workstation with quick release connectors. Panels not in use store conveniently on the back of the workstation. Troubleshoot VFD Power Failures, Input Failures, and More! The 85-MT101 teaches electronic drive troubleshooting in a systematic manner with real faults. Up to 22 faults can be inserted throughout the system, including inside the drive as well as to external wiring and components. Terminal strip test points are available at key locations to aid learners in their VFD troubleshooting process without damage to the equipment. The included curriculum covers the configuration, diagnostics, and troubleshooting of various AC drives used in industry. As an example, specific topics include: three major categories of VFDs; the menu structure of parameter files displayed on the HIM; AC drives safety rules; analog input and output instructions; two common VFD failure symptoms; and the advantages of a general-purpose AC drive. This interactive multimedia curriculum features video, audio voiceovers, 3D animations, and interactive quizzes and activities. A sample copy of the AC Electronic Drives Student Reference Guide is also included with the system for your evaluation. Sourced from the system’s curriculum, the Student Reference Guide takes the entire series’ technical content contained in the learning objectives and combines them into one perfectly-bound book. Student Reference Guides supplement this course by providing a condensed, inexpensive reference tool that learners will find invaluable once they finish their training making it the perfect course takeaway.